Nowadays, a growing list of XSLT processors exist with the purpose of transforming XML documents to other formats such as PDF, HTML or SVG. To this end such processors typically offer a powerful set of functionalities – which, from a security point of view, can potentially pose severe risks. Within this post, we highlight some of the threats one gets exposed when operating a misconfigured XSLT processor. The goal here is to increase people’s awareness when configuring modern XSLT processors. The subsequent table lists the XSLT processors investigated in our tests. 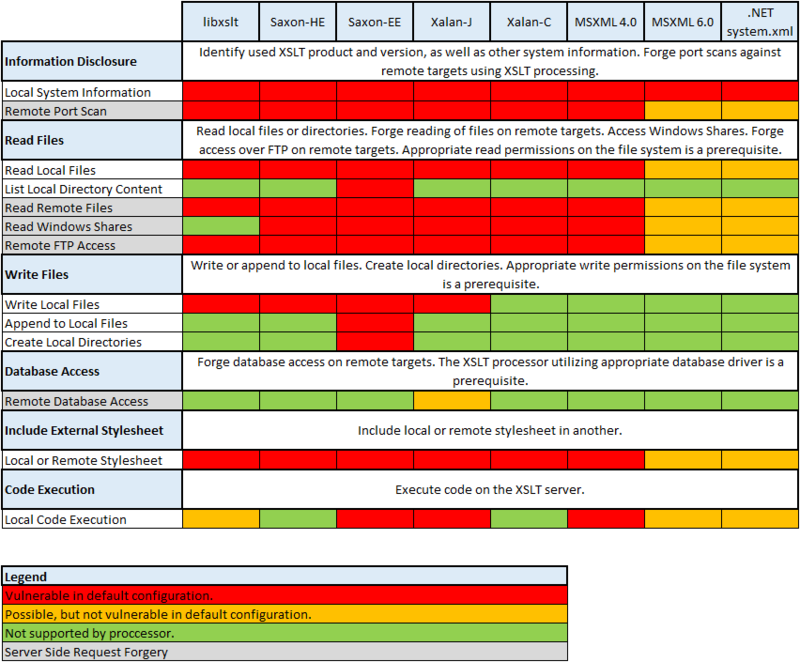 The above results clearly show that the great functionality of modern XSLT processors comes with a tremendous downside: If used in their default configuration, or otherwise not properly configured, XSLT processors can endanger confidentiality and integrity on XSLT servers or allow the execution of arbitrary code. Even worse, the vulnerable XSLT server might be abused to forge attacks against remote third parties, such as for instance performing anonymous port scans (see example below). Here, we give a short example of how to misuse the document() function (used to access external XML documents) on a remote XSLT server to forge port scanning against an external third party. In the example, the investigated third party is located on host “example.com“, and tested against port 22 (SSH). The attacker “Mallory“, trying to learn whether or not port 22 on “example.com” is open or closed, submits the following XSL file to a server “Alice” running a vulnerable XSLT processor. Next, “Alice” processes the XSL file submitted by “Mallory” and as consequence tries to access the external XML resource located on “example.com“. Dependent on whether or not port 22 is open on “example.com“, a different response is sent back to “Alice“, who finally forwards the result to “Mallory“. Since the result “Mallory” receives is different for open/closed ports, she can learn the port state on “example.com“. Note that in this way “Mallory” has performed the port scan anonymously, since the only party speaking to “example.com” was “Alice“. In summary, “Mallory” was able to forge a port scanning request from “Alice” against “example.com“.